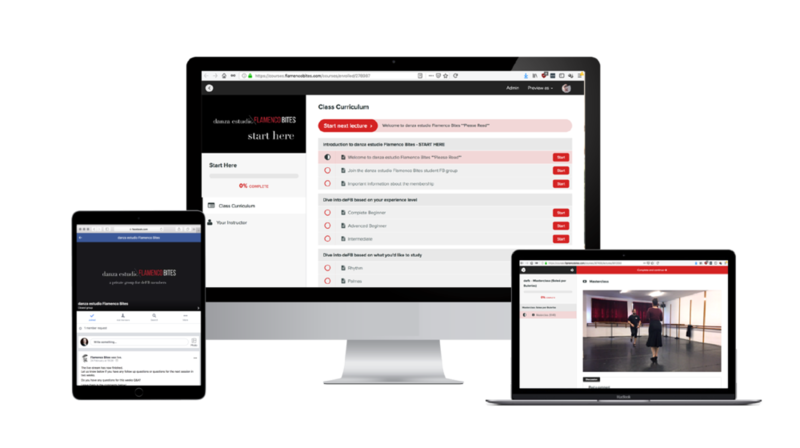 Whether you're an experienced dancer or you’re just starting out, you'll always know exactly what to work on thanks to our extensive course library and coaching. Our online seminars are an essential part of danza estudio Flamenco Bites. These sessions allow you to learn with our experienced, knowledgeable and friendly instructors, in real-time from the comfort of your home. More than just courses, we’re a community of flamenco aficionados. Our private facebook group is our community forum here within danza estudio Flamenco Bites that’s going to connect you with other flamenco dance students just like you. Always available, wherever you are, whatever you use. José Merino is an international dance artist, teacher and choreographer. Jose made his professional debut with BALLET DE MADRID led by José Granero. A former dancer with the acclaimed BALLET NACIONAL DE ESPANA, he performed the role of soloist and first-dancer for many productions and has toured extensively throughout the world. He has worked with and been a guest artist with the renowned company of Antonio Canales and the company of Karine Saporta - National Center of Normandy (France) among many others. Since her debut at age 15 with the "Mariemma Ballet de España" she has been a soloist for various Flamenco and Spanish Dance companies, working with directors and choreographers such as Mariemma, Antonio Ruiz, Pedro Azorín, Juanjo Linares, Antonio Alonso, Alberto Lorca, María Rosa, Mario Maya, Tomás de Madrid, Manolo Marín, Manolete, La Toná, Carmen Cortés, Antonio Reyes, Ricardo Franco, Ricardo Cue, Luis Olmos and Santiago Sánchez among others. She was a co-founder of the company "Malucos Danza" directed by Carlos Chamorro where she collaborated closely in all her productions as an interpreter, choreographer and assistant from 2002 to 2011. She has choreographed and collaborated with the companies "Cruceta Flamenco" and "R + D Dance. She was Assistant to the Choreographic Director for the Teatro de la Zarzuela and the company "Europa Danse". She participated in several projects of the company "Flamencos en Route", in Switzerland and was dancer and choreographer for the show "Lola Greco en Esencia", created for the 63rd International Festival of Music and Dance of Granada. Renae Harvey is a Madrid trained flamenco dancer and teacher dedicated to providing opportunities people who for geographic or financial reasons may not have access to the art of flamenco dance. Born in Western Australia and currently based in Madrid, Renae has performed in Australia, Japan, the United Kingdom and Spain. Manuel made his professional debut at 7 years old with the Ballet Nacional de España in the production of Medea. Throughout his career he has danced with almost every famous name in flamenco including Joaquín Cortés, Antonio Canales, José Granero, Concha Velasco, Blanca del Rey, Merche Esmeralda, Belén Maya, Rafaela Carrasco and others. With his own company he has performed in Barcelona, Madrid, New York, Sevilla and Jerez. Manuel has been a resident maestro for 15 years in the studios of Amor de Dios, and has taught in Paris, Marseilles, Copenhagen, Stockholm, Mexico City, Santiago, Sao Paulo, New York, Toronto, Montreal and Tokyo. Access hundreds of hours of amazing, in-depth flamenco dance lessons including hours of step-by-step instruction, and much more from the biggest names in flamenco dance education. Twice a month we stream live to answer all the questions member’s have that have come up during their training. It’s a great opportunity to get answers to your own questions and from those of your fellow students. Connect with fellow dancers from around the world who are just like you in our member’s facebook group. Our students are focused on getting their dancing to the next level, but also on helping other students around them. Get direct feedback and answers to all your burning questions from Jose, Renae, and your fellow students through our live Q&As, community forum or using the private coaching channel available to all members. Where appropriate, courses are accompanied by highly detailed workbooks which include notation of steps and further explanation of concepts taught, and downloadable music for practice. When you join daza estudio Flamenco Bites you are fully protected by our 100% Satisfaction Guarantee. If you don't feel like you've received value and you decide you want to cancel any time within the next 30 days, just let us know and we'll send you a prompt refund. We only want you to pay if you actually LOVE your danza estudio Flamenco Bites experience. Join below and try it out totally risk-free. If it’s not for you, simply cancel your membership within 30 days and contact support for a full refund. As long as you remain a paying member you will have access to all of the course videos and PDF downloads. The course materials are delivered as streamed video content and PDF course workbooks. No, the purchase of a danza estudio Flamenco Bites membership is for personal use only and sharing of your personal login is not permitted. What level of flamenco dance do I need? There are courses of varying levels from complete beginner up to intermediate. If you need help deciding what to study we will be happy to help you choose a course based on your needs. What is your membership cancellation policy? You can cancel your subscription at any time. When you cancel your membership you'll keep access through to your next renewal date, at which time your account will be converted to a Basic Free membership. You cancel your subscription yourself from within your account dashboard or by sending an email to hello [at] flamencobites.com. Why should I join? I am kinda busy right now. Because the sooner you devote some time to your flamenco study and practice the closer you will be to achieving your goals! Will it work for me if...? There is no way to get around the fact that if you want to be a confident, accomplished flamenco dancer then you need to devote some time to practice. If you are someone who is motivated and ready to learn then you will benefit from everything we have available in our online studio. And if you need help we are here! You are never on your own. When you join us you'll have access to our entire library of classes for just $1.13 USD per day! Please ensure that you seek professional medical advice before undertaking any Flamenco Bites classes or workshops. Particularly if you have not undertaken exercise for a long time or if you have any concerns about your health and fitness. Flamenco Bites is not responsible for any injury or damage caused by following these videos or taking part in a live class. The videos provided in this course are for personal use only and may not be distributed, reproduced or shared in any form. By purchasing the class/course you are agreeing to these terms. Flamenco Bites reserves the right to update these terms at any time.